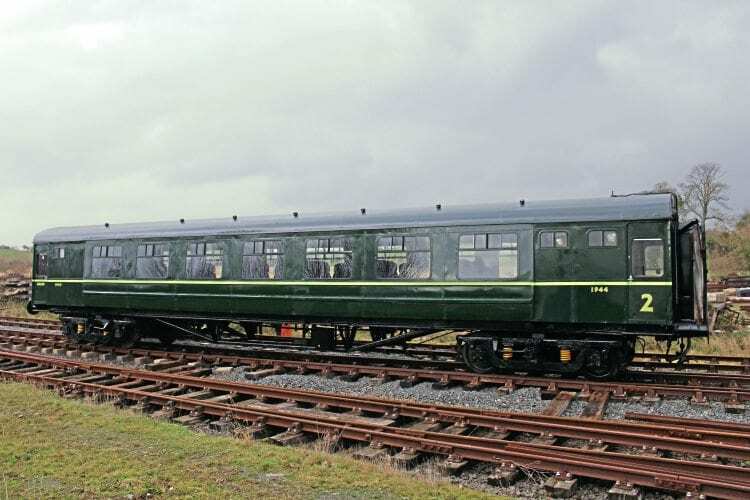 PASSENGERS are once again able to experience travelling in one of Córas Iompair Éireann’s (CIÉ) Park Royal carriages after the Downpatrick & County Down Railway (DCDR) completed the restoration of 1955-built Brake Standard Open No. 1944. The vehicle emerged from the DCDR’s workshops on November 24 for its first gauging runs over the line behind GM Class 141 No. 143 and later with O&K 0-4-0ST No. 3. Park Royal-built Brake Standard Open No. 1944 shows off its newly completed CIE livery in the yard at Downpatrick following removal from the workshop on November 24. At 10ft 2in wide the Park Royals made full use of the more generous Irish loading gauge, and although No. 1944 has worked over the railway before, much track work has taken place in the 20 years since it last ran. No. 1944 was one of 50 constructed at Inchicore to a design by O V S Bulleid using parts supplied by the Park Royal Works in London. It was originally built as Suburban Open No. 1381, and later rebuilt as a Brake Standard Open and renumbered accordingly. As No. 1944 it became one of the final three ‘Park Royals’ in service with Iarnród Éireann until withdrawn in May 1994. It reached Downpatrick the following year and was immediately pressed into service, peeling paint and all-pervading damp odour included.